MANILA, Philippines - The Professional Regulation Commission (PRC) announces the full results of May 2017 Certified Public Accountant (CPA) board exam which include the top performing schools and alphabetical list of performance of schools today, May 29 or in 5 working days after the exam. 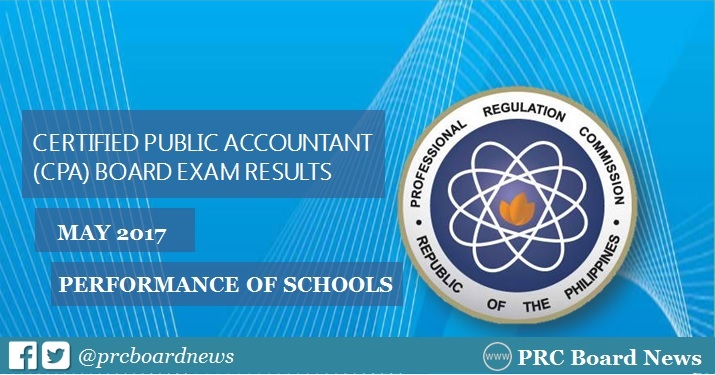 PRC announced that 3,389 out of 9,645 (35.14%) passed the CPA board exam. PRC hailed University of San Carlos (USC) as the top performing school with 94.29% or 66 out 70 passed the exam. The examination was conducted on May 14, 15, 21 and 22 in cities of Manila, Baguio, Cagayan de Oro, Cebu, Davao, Iloilo and Legaspi. In the May 2016 licensure exam, PRC hailed De La Salle University (DLSU) as the top performing school with 93.10% passing rate or 54 out of 58 passed the exam. In the May 2015 exam, University of San Carlos topped the schools with 88.06% or 59 out of 67 passed the exam. DLSU also ranked highest in the July 2014 exam, 90.67% or 68 out of 75 passed the exam.